New York – March 22, 2016 – Carroll Shelby Foundation will auction the 50th anniversary Ford Shelby GT-H prototype at the inaugural Barrett-Jackson Mohegan Sun Auction in Uncasville, Connecticut, on Friday, June 24, 2016. Proceeds will benefit the Carroll Shelby Foundation, dedicated to providing medical assistance and educational opportunities for children and young people. Aaron Shelby, grandson of company founder Carroll Shelby, will drive the car on the block. The winning bidder of the Shelby GT-H prototype – selling at No Reserve – will own a unique piece of history. The car debuted hanging on the wall of the Jacob K. Javits Convention Center during the 2016 New York Auto Show. In 1966, Carroll Shelby approached Hertz with a unique opportunity to put customers in the driver’s seat of high-performance special edition Shelby’s. A collaborative effort, Ford supplied the new Mustangs, Shelby added extra performance and style and Hertz gave the public access to a unique driving experience. The three companies repeated the formula with the Shelby GT-H program in 2006 and again in 2016 with the 50th anniversary edition car. Based on the popular design of the Ford Mustang GT, the limited-edition 2016 Shelby GT-H was unveiled as part of a special 50 year celebration during the New York Auto Show. In addition to the iconic Shelby and Hertz livery, the car features a very classic, muscular look with more performance capabilities. Sporting the iconic black and gold Shelby and Hertz livery, the 2016 Ford Shelby GT-H is instantly recognizable. Each Shelby GT-H will wear black exterior paint, along with gold racing stripes, a hallmark of Hertz vehicles dating back to the 1920s. In addition to Shelby’s traditional “Le Mans” dual racing stripes, each car will sport a set of rocker stripes that include special “Shelby GT-H” nomenclature. 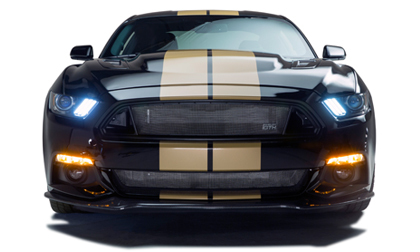 Additional graphics include Hertz emblems on the front fenders, Hertz Shelby GT-H sill plates and a numbered badge. From a performance standpoint, the Shelby GT-H receives a performance cat-back exhaust courtesy of Ford Performance for that throaty sound that will set this car apart as a Shelby Mustang GT-H. To put all of the horsepower to the ground, the Ford Shelby GT-H also comes with the Ford Racing Handling Pack, including special-tuned dampers, lowering springs, sway bars and a staggered wheel kit that includes 19-inch aluminum wheels wearing high performance Michelin rubber. Under the hood, the Shelby GT-H sports Ford’s iconic 5.0 liter V8 motor. To help with performance, the car is fitted with a unique Shelby-designed vented hood, carbon fiber front splitter and rear spoiler. Special badges appear in the front grille, rear faux gas cap and trunk lid. Inside, Shelby GT-H logos are on the head restraint, sill plates and floor mats. Shelby American will build all 140 Hertz rental fleets cars at its assembly facility in Las Vegas.The Ford Shelby GT-H’s will be available for rent exclusively through the Hertz Adrenaline Collection at select locations in the United States. Join the Carroll Shelby Foundation, Barrett-Jackson, Shelby American, Ford Performance and Hertz to make history yet again and honor the legacy of Carroll Shelby. The Carroll Shelby Foundation was created by legendary racer and automotive manufacturer Carroll Shelby. Headquartered in Gardena, Calif., the Foundation is dedicated to providing medical assistance for those in need, including children, educational opportunities for young people through automotive and other training programs and benefiting the Shelby Automotive Museum. For more information visit http://www.shelby.com.